1. 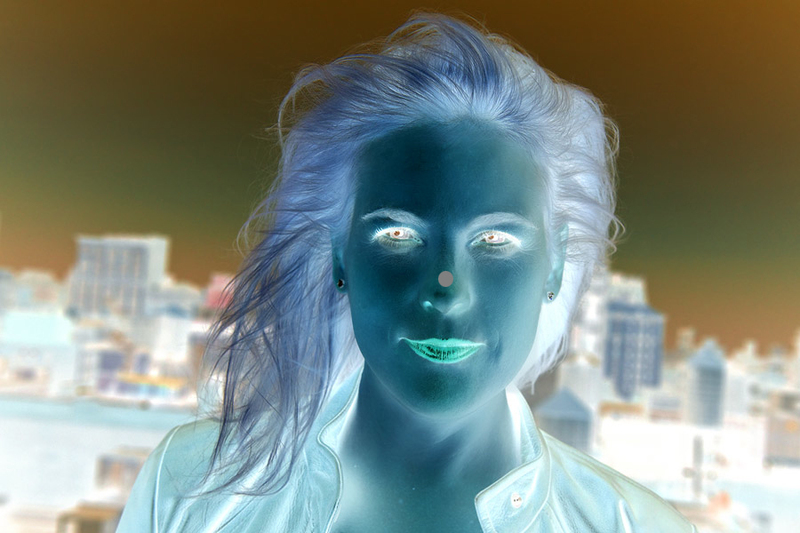 Stare at the gray dot on the woman’s nose for 30 seconds (click on image for larger size). 2. Look quickly at the gray box below (or look at a plain surface like a ceiling or blank wall). What you should see is a full color representation of the image as your retina/brain processes the negative image. Our visual system is constantly processing input and can fool us or create illusions from retinal or cortical processes. This illusion example is called a negative afterimage that is caused by adaptation of the photoreceptors in the retina. Forcing ones eyes to fixate on a point (in this case the grey dot on Laura Galloway‘s nose reduces the normal jitter or micro saccades that constantly occur as we scan things in our visual world. The micro saccades normally cause images to “dance” over the surface of the eye eliminating the possibility of too much adaptation if an image remains static over one group of photoreceptors for too long. In fact, if one were to eliminate all movement of the eye, and we were to fixate on a single point, our perception of our visual world would fade away. So, what happens in this illusion is that when we look from the first image to the grey space or to a large plain surface, the photoreceptors that become adapted no longer signal effectively, but the photoreceptors surrounding the adapted photoreceptors strongly signal perhaps signaling opponent cells in the lateral geniculate nucleus (LGN) involved in color vision. Though other evidence from Dacey, He, and MacCleod suggests that opponency is not necessary to explain the illusion. The image of Laura Galloway was made by friend of Webvision James Duncan Davidson and the image was modified and posted with permission. Thanks Duncan! The idea for this post came from another friend of Webvision, Steven Fliesler who sent along some imagery, a title and some ideas for a post. Many thanks Steve! Thanks to Robert Marc for input on image selection.